Regal’s all new 33 SAV is as exciting as it is unique. Unique in form, in function, in practicality, and in execution. 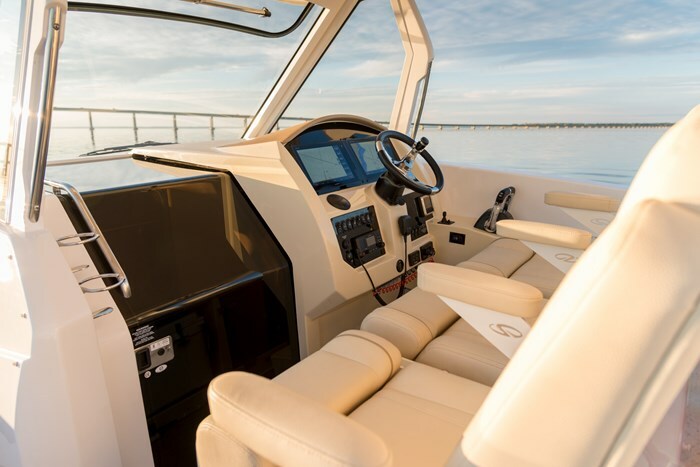 The 33 SAV combines the form of a center console with the function of a comfortable full overnight or weekend cruiser, with the practicality of a day-use bowrider design and with the execution to succeed in all of the above. 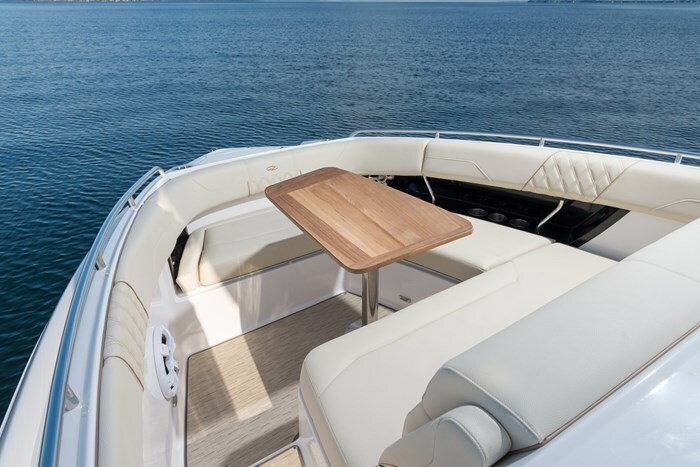 Regal says that its Sports Activity Vessel gives “unparalleled versatility, combined with premium luxury results in an unrivaled, do-it-all, outboard powered day-yacht with overnighting capabilities.” The 33 SAV is all that and perhaps even more. 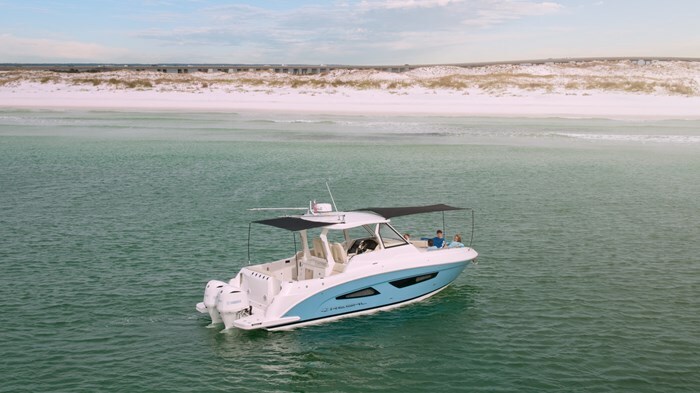 The 33 SAV rides on Regal’s proven OceanTrac hull design at thirty-four feet, two inches LOA on a ten foot, four inch beam with a commendable deep-vee of 21-degrees of deadrise promising a smooth ride in rough seas. Power is from your choice of either twin 300 or twin 350 horsepower Yamaha outboards. Regal adds a vinyl ester hull barrier coat standard to which you may optionally add bottom paint. You may also have your engines painted white. 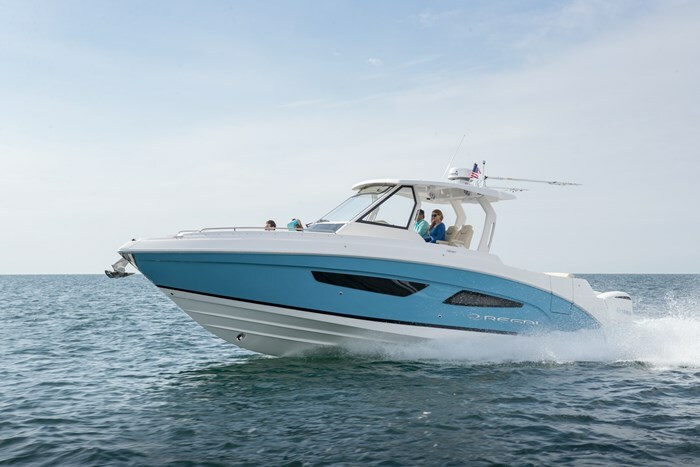 With the standard hardtop and the aft cockpit and bowrider seating, the 33 SAV in profile looks like a center console especially when you see the most convenient port side entry door within the hull side. Then when you learn that the entire cockpit is self-draining and observe the full-length port side stern to bow cockpit walkway plus see three captain’s chairs with flip-up bolsters and armrests at the helm, you may well think it is. 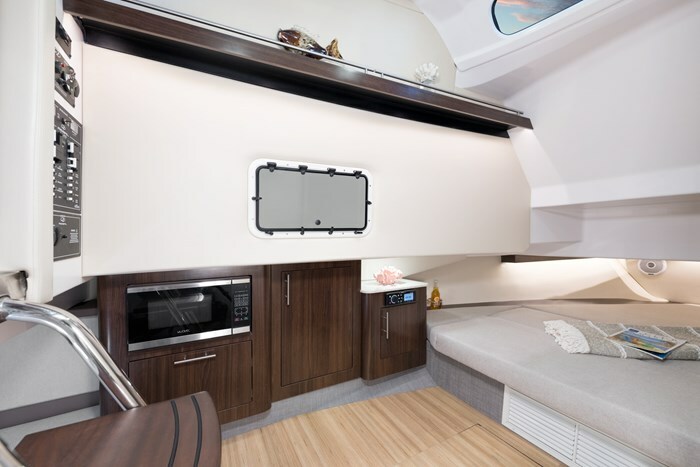 But then when you slide open the cabin door located within the helm and go below, you will find yourself in the cabin of a 33-foot mid-cabin express cruiser with full normal headroom. 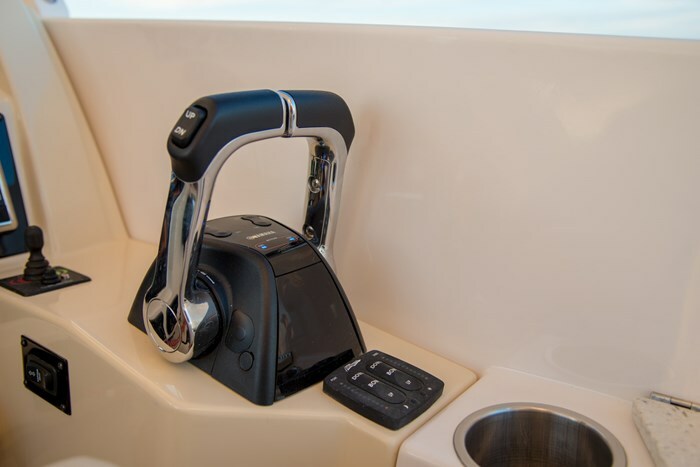 Centrally positioned and beside you to port is a convenience center with storage, a full size microwave, and the Fusion UD650 marine stereo head unit with two 200 watt cabin speakers plus smartphone integration. On the cabin sole is Amtico Classic walnut flooring with an in-floor locker. 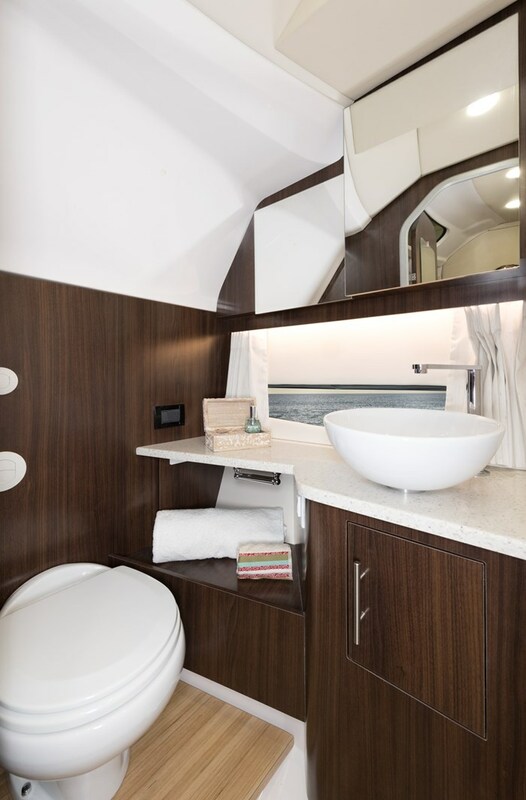 To starboard is the head compartment with vessel sink, storage cabinetry, a “silent” electric head plus a separate walk-in shower stall, all with full headroom. 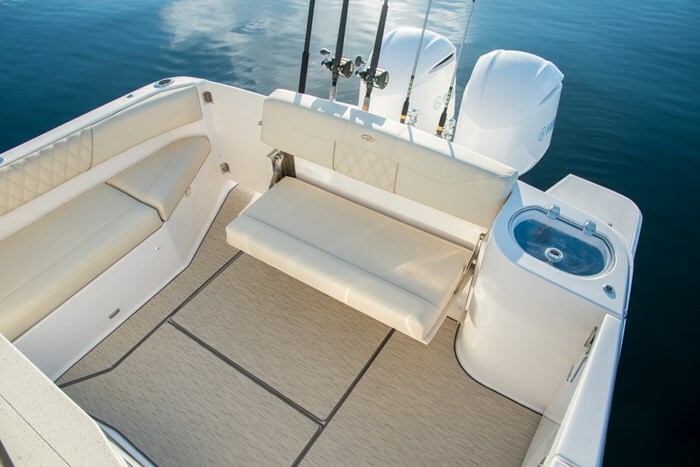 In the bow area is a queen-size berth with a foot section the raises electrically to form a settee. 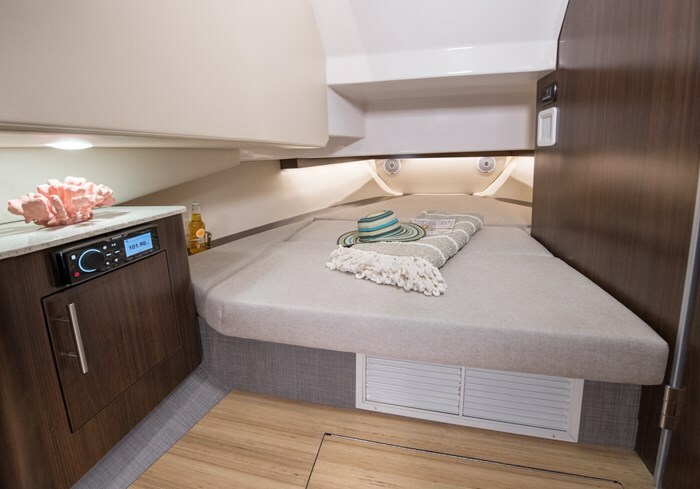 The aft stateroom features a California queen bed plus bedside storage and shelf. Hullside windows provide natural lighting to the cabin as does an overhead skylight. 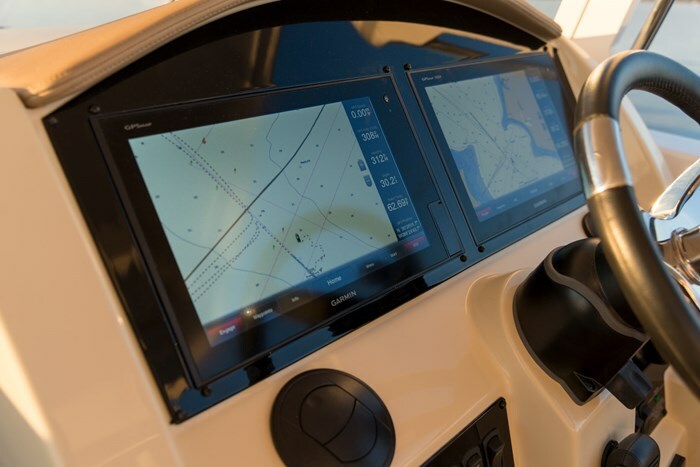 The helm of the 33 SAV features a hand-wrapped steering wheel with a standard in-dash Garmin 7616xsv chartplotter. 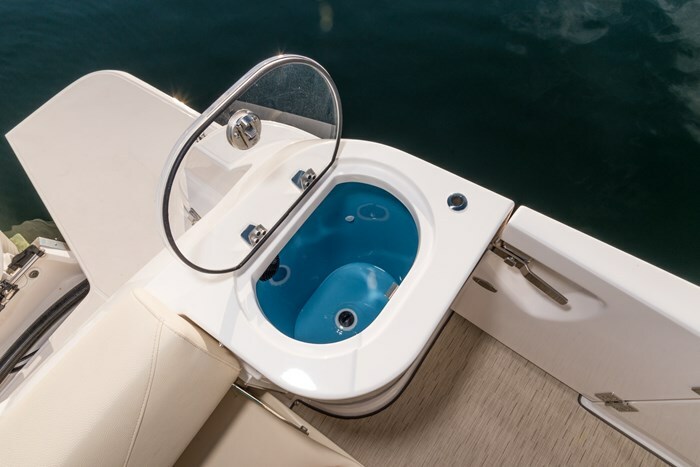 Trim tabs with LED position indicators are standard as is an electrically operated horizontal opening ventilating section at the top of the full-width helm-to-hardtop windshield with standard windshield wiper. 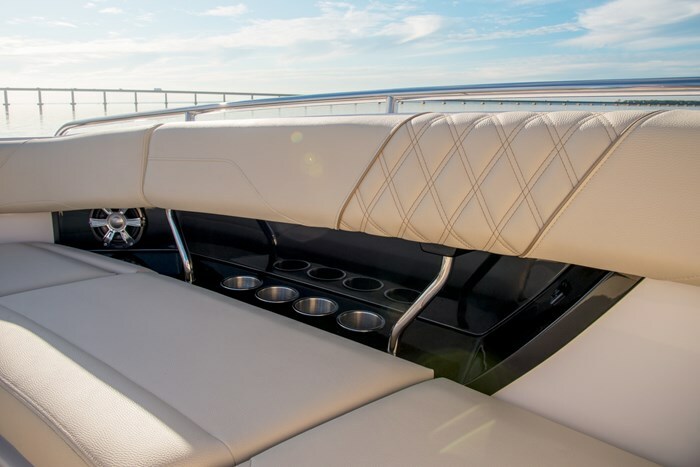 Beneath the captain’s seats is a slide-out Yeti cooler. 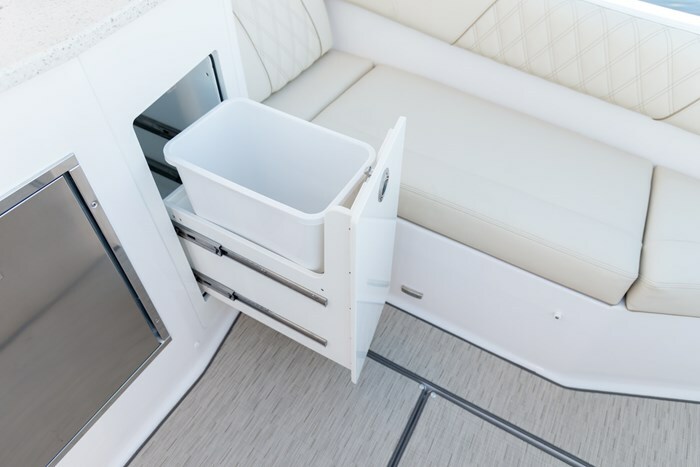 Aft of the helm seats is a standard refreshment center with sink, refrigerator, trash container plus storage drawers. An electric grill plus an overhead fold-away TV are optionally available. 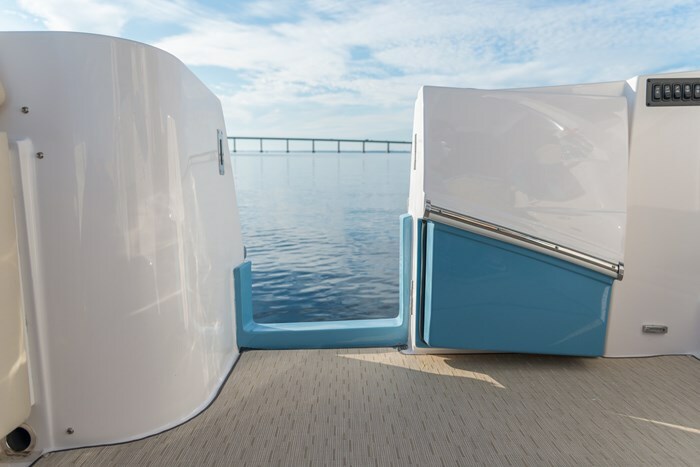 Just aft of this center and within the cockpit sole is a dedicated storage compartment suitable for fenders or dive tanks or optionally convertible to a fish box with macerator. 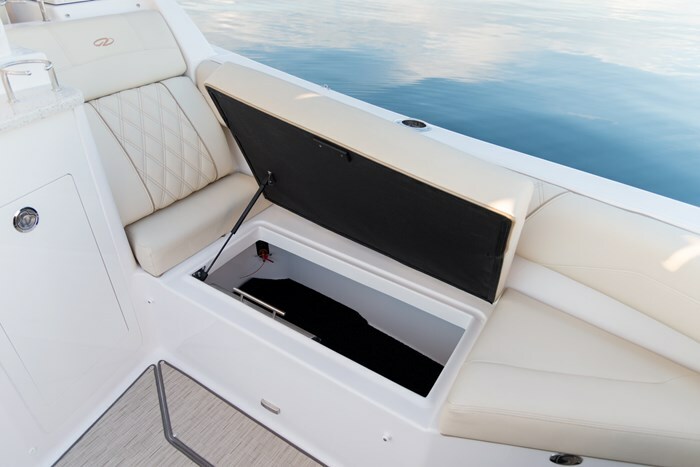 Full U-shaped seating fills the bow with storage beneath all seat cushions. 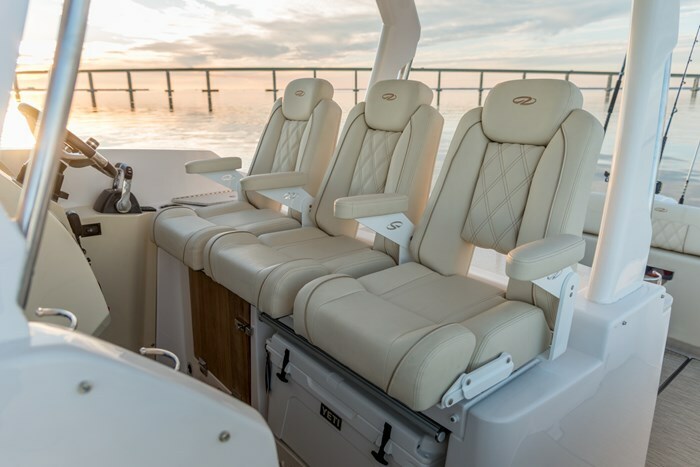 Standard stern seating includes a starboard side aft-facing lounge seat plus a fold-away transom bench seat. A teak cockpit table with dedicated storage is standard as are blue LED courtesy lights, four cockpit speakers plus port side under gunnel storage suitable for fishing rods, boat hooks, brushes, etc. 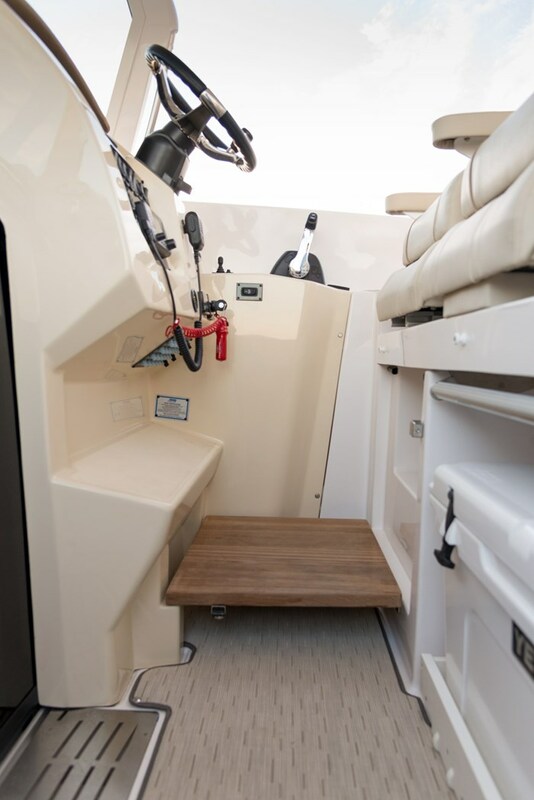 Other notable standard equipment includes a 6.5 kW generator, dual dockside power, battery charger, dockside water, hot water heater, wrap-around swim platform with recessed boarding ladder, transom trim switch, plus blue LED underwater lighting. 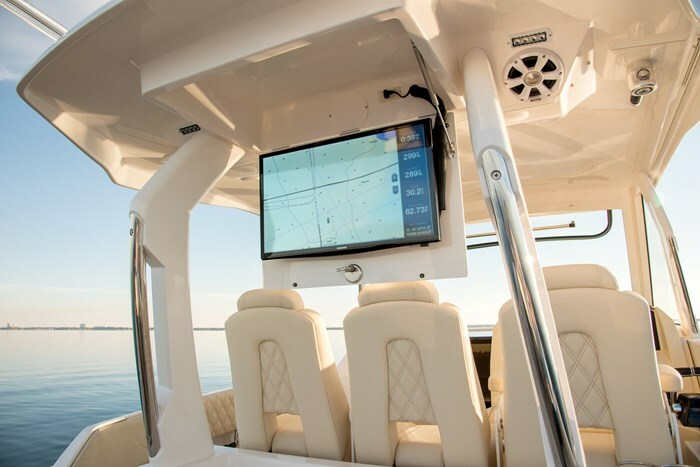 Notable options include Optimus 360 Joystick control, bow thruster, SeaKeeper Stabilization system, anchor windlass, dual Garmin screens, autopilot, radar, reverse cycle air conditioning/heat, ski tow pylon, mid-cabin TV/DVD, bow table with dedicated storage and filler cushion, bow and/or cockpit Bahama Sunshades, bow cover, seat covers, full enclosure for the helm, a Fish Package which includes a livewell, macerator for fish box, transom rod holders, plus raw water washdown, and in addition choose the 15-foot telescoping Top Gun Revolution outriggers. 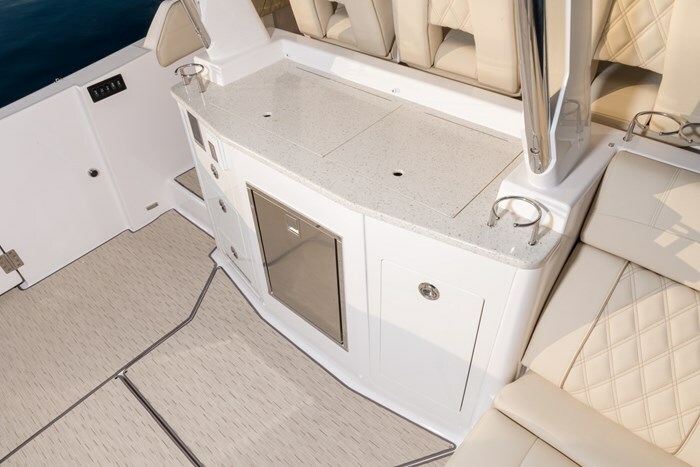 You may also choose from varieties in colour and texture of cabin floor coverings and countertops, plus cockpit and swim platform coverings. 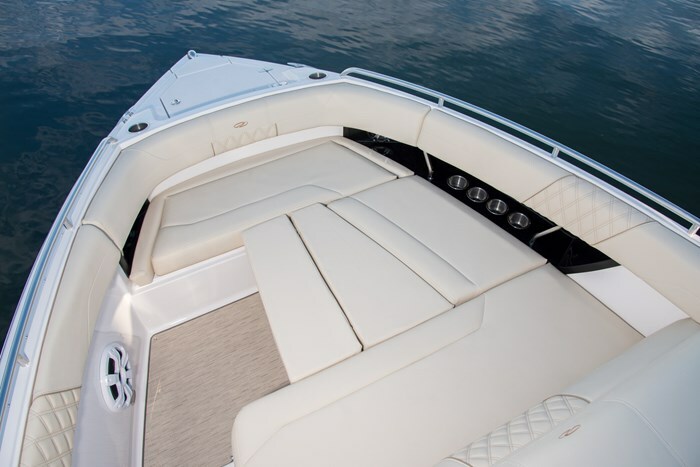 As you can readily see, this 33 SAV pushes many different boating buttons in many different ways. 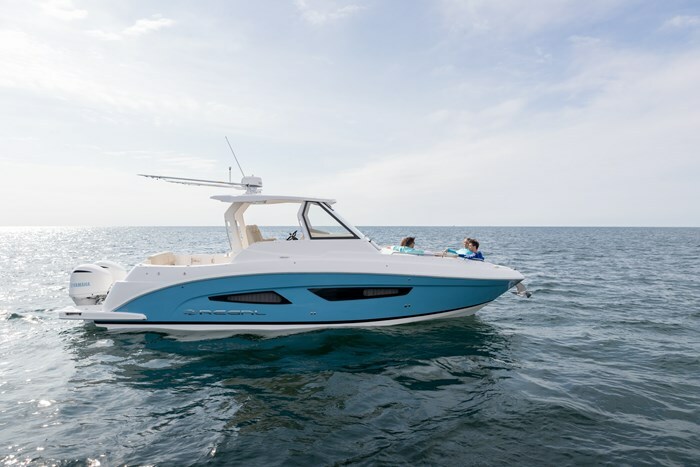 As Regal says, its Sports Activity Vessel is “the ultimate go anywhere action-packed model perfect for any activity.” You need to check it out for yourself.